There are a number of different metrics that can be used to measure the speed of data transfers throughout a network. Being able to tell the speed of your service provides you with a metric to measure network performance. Throughput and latency are some of the most common ways that networks are measured. Measuring the level of throughput or latency can help to identify performance issues on your network. 1.1 What is Network Latency? 2 What Causes Network Latency? 3 What is Network Throughput? 3.2 What Causes Poor Network Throughput? 5 Why are Network Latency and Throughput Important? However, these concepts aren’t the same thing. 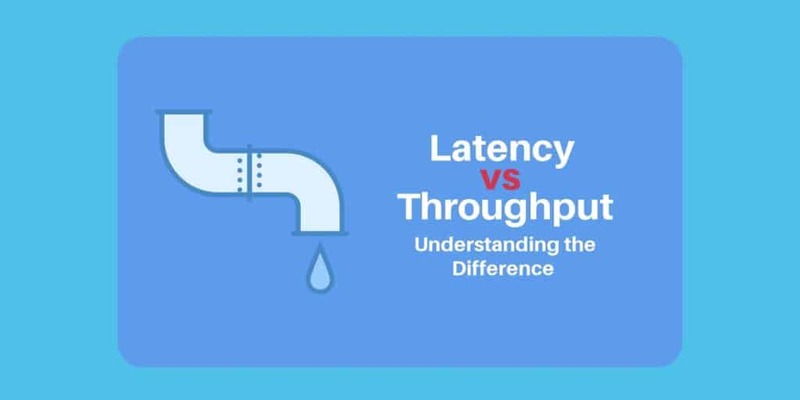 In this article, we’re going to look at the difference between latency and throughput and how they can be used to measure what is going on. Before we do that, we’re going to define what latency and throughput are. Latency – The time taken for a packet to be transferred across a network. You can measure this as one-way to its destination or as a round trip. We’re going to look at these individually in further detail below. But first, we’re going to compare the two directly. The relationship between throughput and latency is underpinned by the concept of bandwidth. Bandwidth is the name given to the number of packets that can be transferred throughout the network. If you were to think of a pipe, a physical pipe restricts the quantity of content that can transfer through the pipe. In the context of a network, this is how many packets can be transferred at once. The time it takes for a packet to travel from the source to its destination is referred to as latency. Latency indicates how long it takes for packets to reach their destination. Throughput is the term given to the number of packets that are processed within a specific period of time. Throughput and latency have a direct relationship in the way they work within a network. The bandwidth of a network specifies the maximum number of conversations that the network can support. Conversations are exchanges of data from one point to another. Latency is used to measure how quickly these conversations take place. The more latency there is, the longer these conversations take to hold. The level of latency determines the maximum throughput of a conversation. Throughput is how much data can be transmitted within a conversation. Naturally, the amount of data that can be transmitted in a conversation decreases the more latency there is. This is because it takes longer for data to be transmitted within the conversation because packets take a longer time to reach their destination. Now we’re going to take a look at these concepts in further detail. First and foremost, latency is a measure of delay. This measure of delay looks at the amount of time it takes for a packet to travel from the source to its destination through a network. Generally, this is measured as a round-trip but it is often measured as a one-way journey as well. Round-trip delay is most commonly used because computers often wait for acknowledgments to be sent back from the destination device before sending through the entirety of the data (this verifies that there is a connection to send the data to). As a consequence, the presence of latency indicates that a network is performing slowly. The higher the amount of delay the longer it takes for a packet to reach its destination. This results in services that are slow and choppy. For example, if you were typing something into a remote device there could be a couple of seconds of delay before what you’ve typed shows up on the screen. Latency and bandwidth are two very different concepts that have a close relationship with each other. Latency measures the speed of packet transfers whereas bandwidth is used to refer to the maximum capacity of the network. The simplest way to explain the relationship between the two is that bandwidth refers to how big the pipe is, and latency is used to measure how fast the contents of the pipe travels to its destination. These two have a cause and effect relationship. For instance, the less bandwidth you have the longer it will take for your data to reach its destination and the more latency you will have. Likewise, the more bandwidth you have the faster packets will reach their destination. This is the case even if you have low latency. Network latency can be caused by a range of issues but generally, it comes down to the state of routers and the distance between your network devices. The more routers a packet has to travel through the more latency there is because each router has to process the packet. In most cases, this latency isn’t noticeable but when traffic travels across the internet it can be more pronounced (because the number of routers the packet passes through increases). The distance that a packet travels can also have a significant influence on the amount of latency within a network. A packet that travels around the world would have at least 250 ms of latency. In enterprise level networks, latency is present to a lesser extent. When packets travel across a network to their destination, they rarely travel to the node in a straight line. As such the amount of latency is dependent on the route that the packet takes. On a well-designed network, efficient routes should be available so that packets arrive promptly at their destination. If the network is poorly-designed with indirect network paths then latency is going to be much more pronounced. As we said earlier, throughput is the term used to refer to the quantity of data being sent that a system can process within a specific time period. Throughput is a good way to measure the performance of the network connection because it tells you how many messages are arriving at their destination successfully. If the majority of messages are delivered successfully then throughput will be considered high. In contrast, a low rate of successful delivery will result in lower throughput. The lower the throughput is, the worse the network is performing. Devices rely on successful packet delivery to communicate with each other so if packets aren’t reaching their destination the end result is going to be poor service quality. Within the context of a VoIP call, low throughput would cause the callers to have a poor quality call with audio skips. Bandwidth is a term used to describe the maximum amount of data that can be transferred throughout your network. The bandwidth of your network is limited to the standard of your internet connection and the capabilities of your network devices. Think of bandwidth as the limits of your network connection. In contrast, throughput is the actual data transfer rate that occurs on your network. It goes without saying that throughput is lower than bandwidth. That is because bandwidth represents the maximum capabilities of your network rather than the actual transfer rate. This is most important to note during peak periods or when performance issues are rampant as throughput will often be lower than bandwidth. What Causes Poor Network Throughput? Poor network throughput can be caused by a number of factors. One of the main culprits is poor hardware performance. If devices like routers are experiencing performance degradation, faults, or are simply outdated then you can end up with a low throughput. Likewise, if networks are congested with lots of traffic then packet loss will occur. Packet loss is where packets are lost in transit. Low network throughput is often caused when packets are lost in transit. Latency is one of the most reliable ways to measure the speed of your network. Latency is measured in milliseconds. In the event that you want to measure the amount of data traveling from one point to another, you would use network throughput. Throughput is measured in bits per second (bps) in the form of megabits per second (Mbps) or gigabits per second (Gbps). Throughput is the rate at which packets reach their destination successfully within a specific time period. While you can calculate throughput, it is simpler to measure it with bps rather than running a calculation. Why are Network Latency and Throughput Important? Both network latency and throughput are important because they have an effect on how well your network is performing. If latency is too high then packets will take a longer amount of time to reach their destination. The more time it takes for packets to reach their destination, the slower devices, services, and applications will operate within the network. Likewise, the lower the amount of throughput, the lower the number of packets being processed in a specific time period. When latency and throughput have a minimum presence, they aren’t much of a problem. However, the moment latency gets too high or throughput falls, then your network is going to grind to a halt. This is the point at which services will start to perform sluggishly as packets fail to reach their destination at a speed that can sustain the full operation of your network. It is important to measure network latency and throughput because it allows you to check that your network isn’t falling victim to poor performance. There are a number of ways that you can measure latency and throughput but the simplest way is to use a network monitoring tool. This type of tool will be able to tell you when latency and throughput have reached problematic levels. Given the effects of network throughput on your network performance, it is important to monitor for it. To do this you need a network monitoring tool. There are many different tools you can use, but one of the best is SolarWinds Network Bandwidth Analyzer Pack. This solution can measure network throughput to monitor the flow data of throughput alongside the availability of network devices. 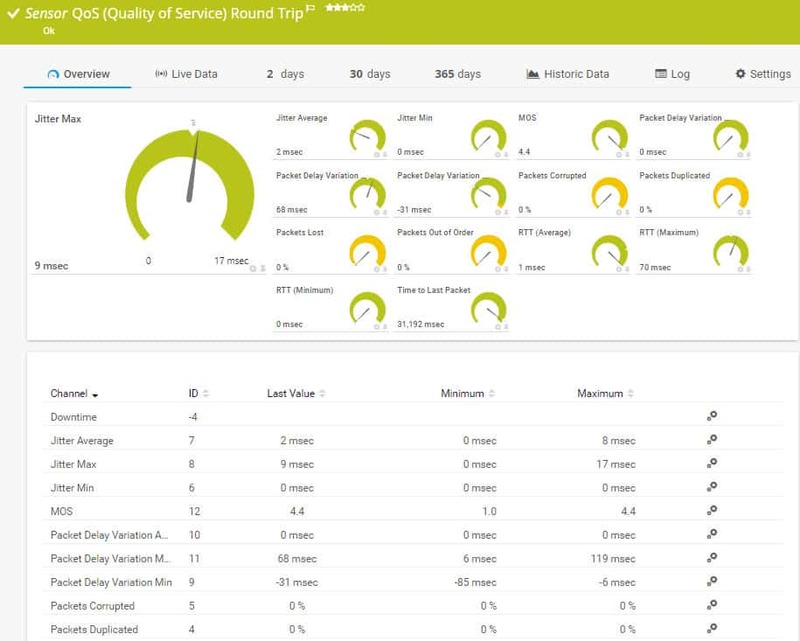 SolarWinds Network Bandwidth Analyzer Pack is a good choice for addressing network throughput because it helps you to point to the root cause. You can detect performance issues within your network and take steps to address them so that throughput drops to a minimum. You don’t get any impressive graphical data representations with these three utilities. Instead, you get straightforward interfaces that will help you utilize the NetFlow v5 messages that your Cisco routers generate. NetFlow is a network protocol developed by Cisco that collects packet information as it passes through the router. 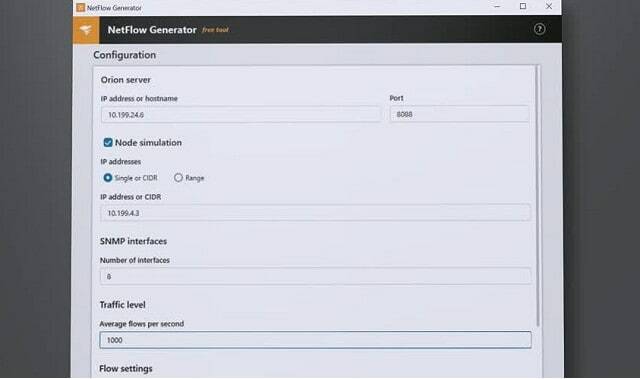 You can use the NetFlow Configurator in the Flow Tool Bundle as a standard interface that contacts a given Cisco router and sets up its NetFlow functions to send data to your collector. The other two utilities in the bundle help you test the network and plan for increases in demand by using NetFlow analysis. The NetFlow Replicator will send NetFlow packets to given destinations on your network. This enables you to study the capabilities of your infrastructure and helps you identify bottlenecks. The NetFlow Generator creates extra traffic for your network. This allows you to test the behavior of load balancers, firewalls, and network performance monitoring alerts. The Flow Tool Bundle is a great free utility that gives you the ability to gain insights into the readiness of your network for expansions in services and demand. Keeping track of the presence of latency helps you to measure the standard of your connection and to identify that your service is performing well without any traffic bottlenecks. Paessler PRTG Network Monitor has a range of network latency monitoring features that make it ideal for this task. With PRTG Network Monitor you can monitor the bandwidth of your network to see the strength of your connection. PRTG’s QoS Round Trip Sensor is used to monitor the latency experienced by packets travelling throughout the network. The QoS Round Trip Sensor can be configured as alerts to notify you when latency exceeds certain thresholds. This is great for allowing you to make sure that latency doesn’t become a problem for your network performance. One of the most important pieces of information you need to know when measuring network throughput is your network baseline. Network baselining is where you measure the performance of your network in real-time. In other words, network baselining is about testing the strength of your live connection. Network baselining is where you monitor your network traffic to identify trends, view resource allocation, view historic performance and identify performance anomalies. Baselining your network provides you with a frame of reference for you to call upon when monitoring your network’s performance. For monitoring your network throughput, you would want to keep track of factors like resource utilization and network traffic to see how well the network is performing. Setting up network baselines can be as simple or as complex as you want them to be. The first steps are to draw up a network diagram to map your network and to define a network management policy. The network diagram provides you with a roadmap to your devices and the policy determines which services are permitted to run on your network. If you’ve established that latency and throughput are a problem in your network then there are a number of steps you can take to eliminate the problem. One way to limit network latency is to start monitoring your endpoints. Endpoints are a source of latency because they can be used to run bandwidth-intensive applications. These bandwidth hogs or top talkers take up network resources and increase latency for other key services. 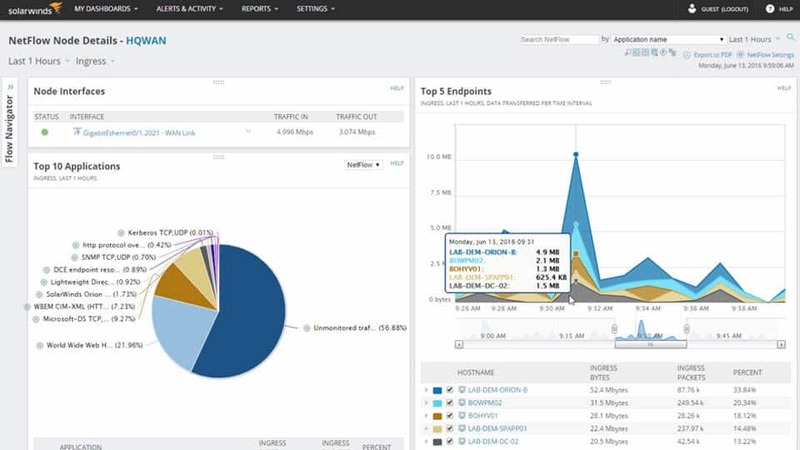 Monitoring these endpoints with a tool like SolarWinds Network Performance Monitor or Paessler PRTG Network Monitor allows you to make sure that it isn’t rogue applications causing your latency problems. Sometimes the cause of latency comes down to network bottlenecks. A network bottleneck occurs when the flow of packets is restricted by network resources. There a number of different ways to resolve bottlenecks but one is improving your LAN design. Segmenting your network into VLANs can help to improve performance. You also want to make sure that server network cards can run at a higher speed than nodes within your network. Restarting your hardware when facing performance issues is troubleshooting 101. Restarting your router clears the cache so that it can start running like it was in the past. This can also be applied to your computers as well. While this seems like a simple solution you’d be surprised how many performance issues can be resolved by implementing these basic steps. Monitoring your latency and throughput is the only way to make sure that your network is performing to a high standard. If there’s high latency and low throughput then your bandwidth is being put to poor use. The sooner you know about it the sooner you can take action and start troubleshooting. Without a network monitoring solution, it’s going to be much harder to keep track of these entities. Failure to keep track of these will result in poor network performance. The moment you see that there’s the presence of latency for instance, you know that packets are taking too long to reach their destination. This can lead to throughput which limits the number of packets that can be sent during a conversation. This means it is time to start troubleshooting for the cause of latency and throughput. After monitoring your network you can then look for various fixes in your network to see if the problem is eliminated. If the problem persists then you simply continue until you find the root cause. Once you’ve finished troubleshooting you should have found the origin of the problem and fixed it. By having clear metrics to act on from a network monitor you can maintain your performance as soon as possible. See also: What is QOS?